The 2016-17 Band Banquet & Awards will be held on Monday, May 22nd @ 5:00 PM at This Is Is on Frankstown Road. All members of the Greater Johnstown Trojan Marching Band, Indoor Colorguard/Percusssion & Middle School color guard can attend for free. Additional parents and/or guests will be $16. Please RSVP to Dawn Asure BEFORE May 15th via email or phone. I have also attached the Banquet Flyer. This year's theme is "Wild Wild West". Hope to see you there!!! 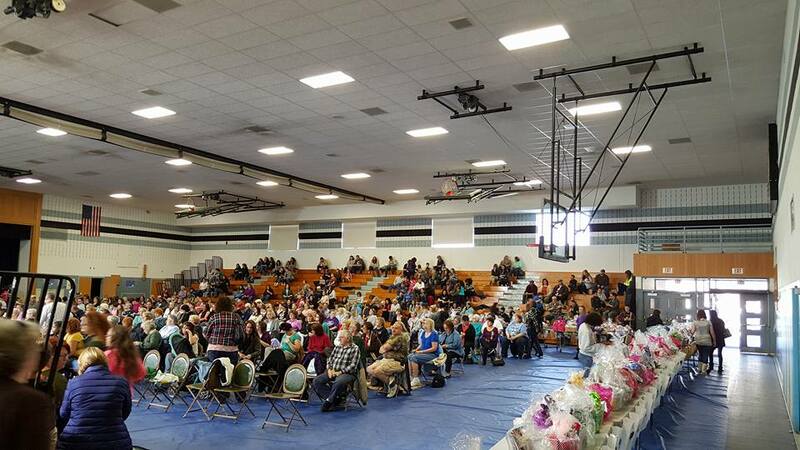 The GJSD Band Boosters in coordination with the GJSD Music Department Set to host our annual Indoor Home Show. Fifty twirler groups, indoor guards, percussion Ensembles and Dance Teams will compete on April 22nd at Johnstown High School. Tickets are $8.00 with the first group competing at 11:00. The Greater Johnstown Indoor Percussion, High School Indoor Guard, and Middle School Indoor Guard have a strong start to season! Catch the indoor ensembles at our upcoming competitions at McKeesport, Westmont, Homer Center and at our home show on April 22nd. Regional Championships is at Tyrone HS and the following week we are off to Wildwood, NJ for our all region championships. Come support some amazing students! 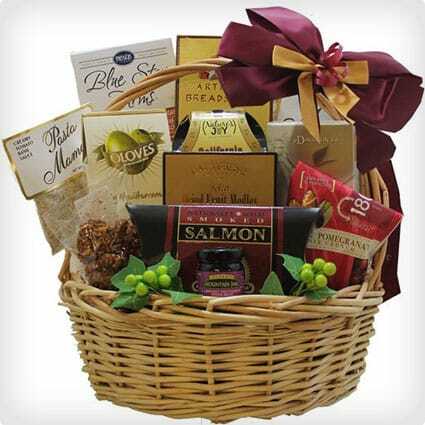 The annual Johnstown Band Booster basket party will be held on Sunday, January 29th @ Westside Elementary School. Doors will open at 12pm with drawings starting promptly at 2pm. Admission tickets are $8. Please see a Johnstown music student for admission tickets as that will benefit their account. If you are unable, please contact Dawn Asure (814) 270-7884 for tickets. HOPE TO SEE YOU THERE! Band Boosters set to host "A Night at the Races"
The Band Booster horse race is back! Please join us for a night of fun races, drawings, and great food and drinks! Saturday, November 19th @ St. Theresa's Social Hall. 536 Decker Ave. Doors open at 5:30 and you can purchase a horse for $15 or general admission is $10. Please contact Dawn Asure (814) 270-7884 or Jen Miller (814) 691-0627 ASAP to reserve your horse and/or admission. Tickets will go fast! Thank you for supporting the Johnstown Band Boosters! 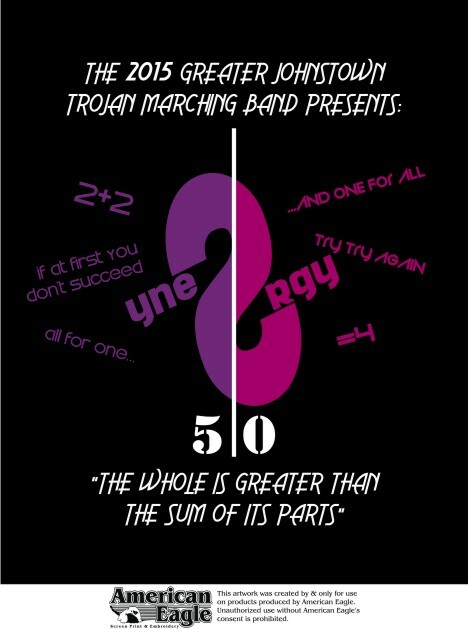 The 2016 "Trojan Classic" Marching Band competition will be held on Saturday, October 15th at 6:00PM inside of Trojan Stadium. Below are the patron and advertisement forms that were passed out to students. ALL marching band members are responsible for $50 in patrons and/or ads. TRY FOR MORE!! Parents, please also spread the word and get as many as possible. ALL forms and money are due NO LATER than Friday, October 7th in the JHS Band Room safe. Any questions please contact Mr. Pfeil. Attention members and parents. Attached is a copy of the 2016 t-shirt sponsor and donation form. Please print and use as needed. Thanks. 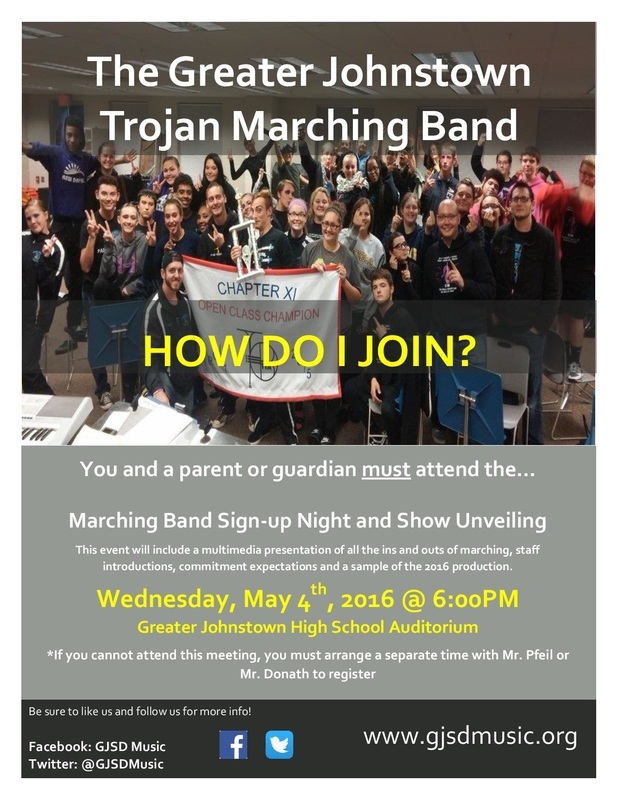 ATTENTION all members of the 2016 Trojan Marching Band. Everything you post on social media can be seen. It can be shared, re-tweeted, and even screenshotted moments before you decide to delete it. We need to make this VERY clear to all of you. PARENTS, please read carefully and help us with enforcing this at home to the best of your ability. Any negative, unfavorable, pessimistic, or overall adverse comments made on Facebook, Twitter, Instagram, Snapchat, or any other form of social media by any one of our members toward our program, our staff, or our members will result in removal from the program. Furthermore, any member that shares or re-tweets such comments will have shown the same opinion and therefore also removed from the program. Students, read carefully. This is a life lesson for you. You will ALWAYS have opinions. That's life. However, the earlier you learn that keeping those opinions to yourself or talking to someone about those opinions in private, the better off you will be in whatever you do in life. If this continues, someone unfortunately will be "fired" from this program. You will regret it afterwards. Make smart choices. Know the power of social media can and will get you in trouble if you aren't careful. Marching Band announces 2016 program "The Theory of Vu"
The 2016 Marching Band season got under way last evening with its annual Sign-Up Night & Show Unveiling event. New and veteran members attended with their parents to get a more in depth look at what Marching Band is and what to expect if they were to join the band. The end of the evening included our 2016 show announcement "The Theory of Vu". The program this year will explore the meaning and feelings behind deja vu (already seen), presque vu (tip of the tongue), and jamais vu (never seen). We would like to congratulate our successful leadership candidates as they were also announced last night. Their names and positions are listed below. Also, check out our updated show announcement trailer! We look forward to seeing everyone on Tuesday, May 10th!! The 2016 Marching Band season is about to begin. Why start in May? You're going to have to attend to find out. Any and all interested students should attend our annual Sign-Up Night being held Wednesday, May 4th @ 6:00PM in the High School Auditorium. You must bring a parent or guardian with you. This evening DOES NOT commit you to being a part of the marching band. This night is intended to give you all of the information you will need on what Marching Band is, the commitment level needed, and of course how to sign-up to be a member. We will also unveil the 2016 show with a short audio example! Lets continue this Pride & Tradition and lets get as many people as possible to attend Sign-Up Night!! Would you fit one of these roles perfectly? Do you have what it takes? If so, then get to work on your application today! Applications are due to Mr. Pfeil by Wednesday, April 27th @ 12:00PM. Please see Mr. Pfeil with questions regarding the application process. Good luck to all. Successful leadership applicants will be announced at Marching Band Sign-Up Night on Wednesday, May 4th @ 6:00PM in the JHS Auditorium. Click HERE for the 2016 leadership application and information. A promising 2016 for the GJSD Music Department! It has been awhile since you have heard from us here within the GJSD Music Department. Things are going strong and we are looking forward to a wonderful year of music making in 2016. We ended last year with a wonderful concert season within the JHS Cochran Auditorium. As 2016 began we hosted our annual basket party which was the largest in years! All three indoor groups are off to a great start and we look forward to hosting on Saturday, April 16th here at JHS. 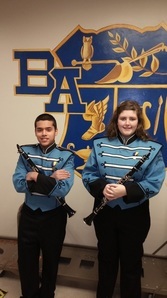 Many talented JHS musicians are attending district and regional band/orchestra events. 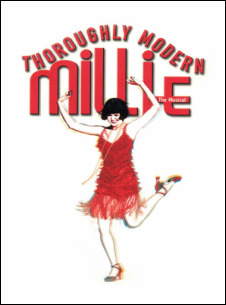 The 2016 musical season is also in full swing with performances of Thoroughly Modern Millie​ to begin on Thursday, April 7th. We encourage you to stay informed with our events via the calendars tab above or by following us on Twitter or Liking us on Facebook. Need more information? CONTACT US! The 2015 Greater Johnstown Trojan Marching Band brought home their 2nd straight Region XI Championship this past weekend at IUP with a score of 84.9 along with high percussion and high colorguard. This championship caps of another great Region XI season for the band. The band now gears up for their All-Chapter Championship performance this upcoming weekend in Hershey. Well, after a little fun first. The band is headed to HersheyPark in the Dark on Saturday, October 31st before spending the night in Hershey and resting up for a Sunday performance. Good luck to all this weekend and congratulations on another Region XI Championship!! The 2015 Trojan Marching Band is currently accepting order forms for show shirts. Order forms are due by the end of the home game on Friday, October 9th. Order forms need to be placed in an envelope along with payment and dropped in the safe in the JHS band room. Below you will find an order form along with photos of what the front and back of the shirt will look like. Get your orders in ASAP. Any questions see Mr. Pfeil. *NOTE - The back image is not what you will see on the shirt. The top section WILL be centered with everything else like you see on the order form. 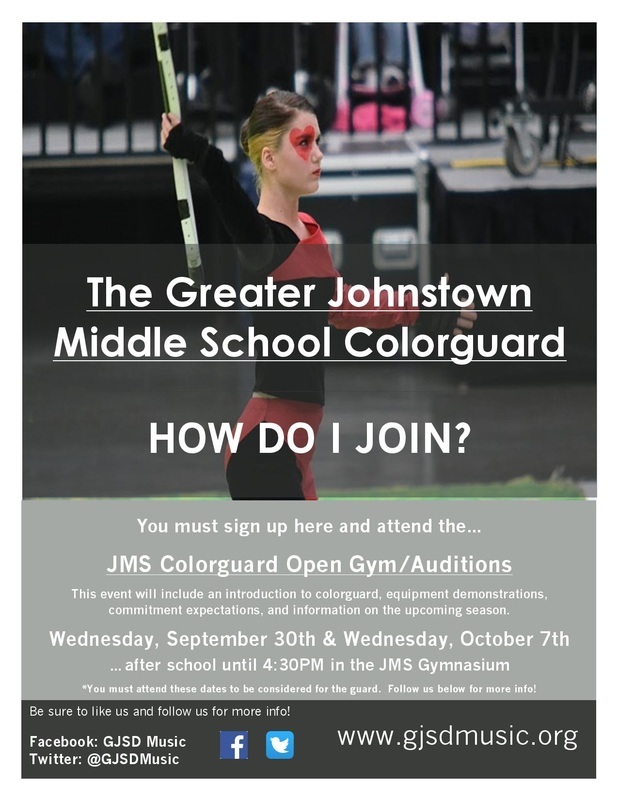 The 2015-2016 Johnstown Middle School Colorguard season officially begins tomorrow with sign-ups taking place in the JMS cafeteria during all 3 lunches. Sign-ups will last two weeks ending on Friday, September 25th. Students should print their name & grade and take the below flyer with them. It will be mandatory for all students to attend OPEN GYM & AUDITIONS taking place on Wednesday, September 30th & Wednesday, October 7th after school until 4:30 in the JMS gymnasium. Be sure to like us on Facebook and follow us on Twitter for more information down the road. Ms. Tori Sterner will be returning as Director along with a new instructor which should be hired in the next month. We will share with all of you once we find out who has been hired. The GJSD Music Department would like to wish the very best to Ms. Katie Jones as she will not be returning this year to work with the guard. Katie is moving out of state and entering a new chapter in her life. Thank you Katie for all of your hard work and good luck in your future endeavors! 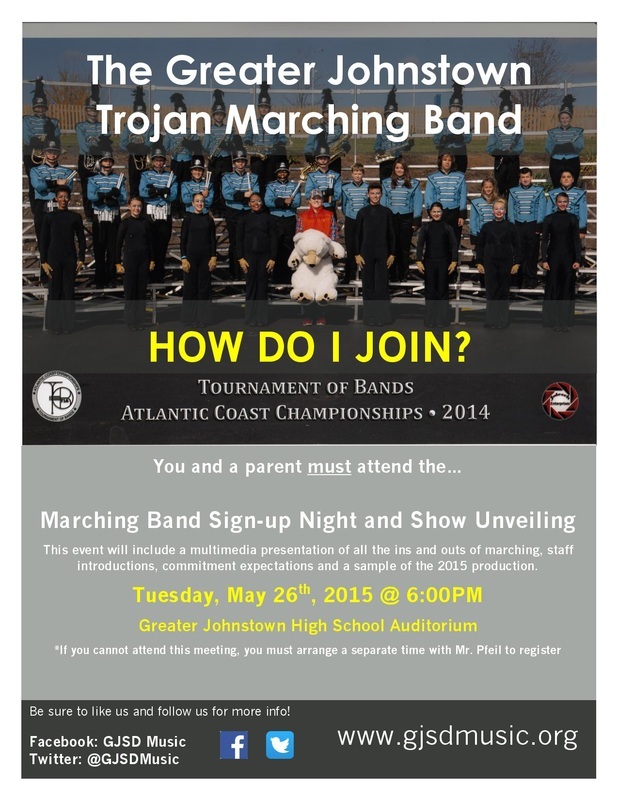 Sign-Up Night for the 2015 Trojan Marching Band! The 2015 Marching Band season is about to begin. Will you be a part of it? Any and all interested students should attend our annual Sign-Up Night being held Tuesday, May 26th @ 6:00PM in the High School Auditorium. Please bring a parent with you. This evening DOES NOT commit you to being a part of the marching band. This night is intended to give you all of the information you will need on what Marching Band is, the commitment level needed, and of course how to sign-up to be a member. So, will you be there? Lets make this the biggest and best season yet for the Trojan Marching Band! 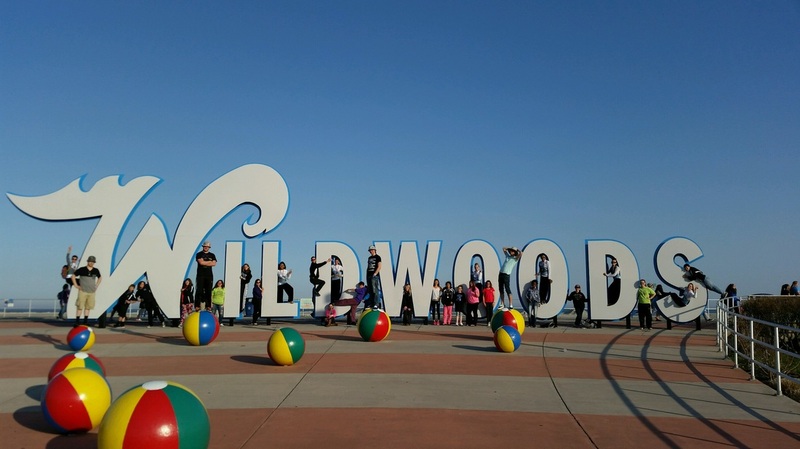 What a great weekend in Wildwood! This past weekend the indoor percussion as well as the MS and HS guards competed in Wildwood, NJ in the TIA All-Chapter Championship competition. The weekend was a huge success and this season has been rewarding not just for the students, but for the staff as well. We look forward to the seasons to come! Congratulations on such a successful season! Indoor Guards and Percussion Compete at Regional Championships! The 2015 edition of the MS and HS indoor guards along with the HS indoor percussion ensembles competed this past weekend at St. Marys at the TIA Chapter 11 Championships. All three groups are full of hard working students who have grown into amazing performers and percussionists! HS Guard: 1st Place Score of 86.81--------->Chapter Champions! 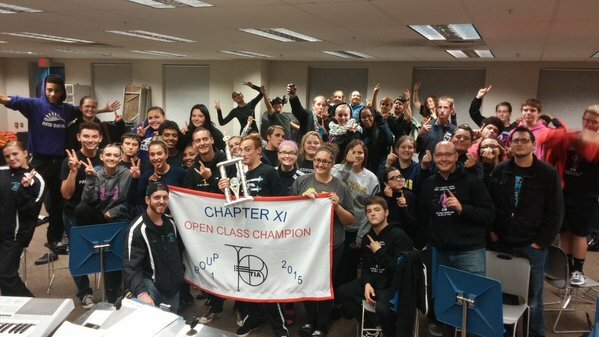 HS Percussion: 1st Place Score of 87.1--->Chapter Champions! We are preparing to go to Wild wood, NJ for championship competition this week. As the groups continue to improve and clean their shows, the ensembles are set up for a great amount of success going into championship weekend. Good luck this weekend!!! The Greater Johnstown Music Department has been very busy since our last update wishing everyone a Happy New Year. Below are some of the things that have been happening within our department this new year. -Festival season is almost over with many talented young musicians representing Johnstown in District 6 events. -The Indoor Colorguard/Percussion season is off and running with all 3 groups having a strong start to their seasons. -The 2015 musical production of Crazy For You opens its curtain in 17 days at Cochran Auditorium with shows on March 19-21 at 7:00PM and a show on March 22nd at 2:00PM. Reserve your tickets in the High School main office or by calling 533-5601. 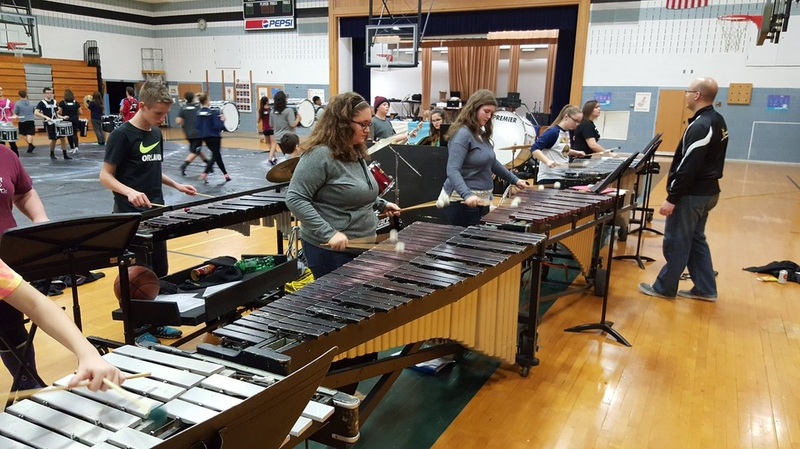 -The Middle School instrumental and performing arts programs got some exciting new this past month with the possibility of a new music wing at JMS. The current plan will renovate the unused auditorium into a new, bigger space for the Middle School ensembles. -The Indoor Colorguard/Percussion HOME SHOW is approaching fast. The event will take place on Saturday, April 18th starting at 12:00PM. Come out and support our groups along side many local ensembles. Happy New Year from the GJSD Music Department! The Greater Johnstown Music Department would like to take this opportunity to wish all of you a safe and happy new year. As we look back on 2014 and remember all of the wonderful moments of music making, we want to also inform you of some of the great events we have coming up in 2015! Below are just a few highlights for the upcoming year but please stay in touch with us using social media and this website for the most up to date events and times. We look forward to seeing you in 2015!